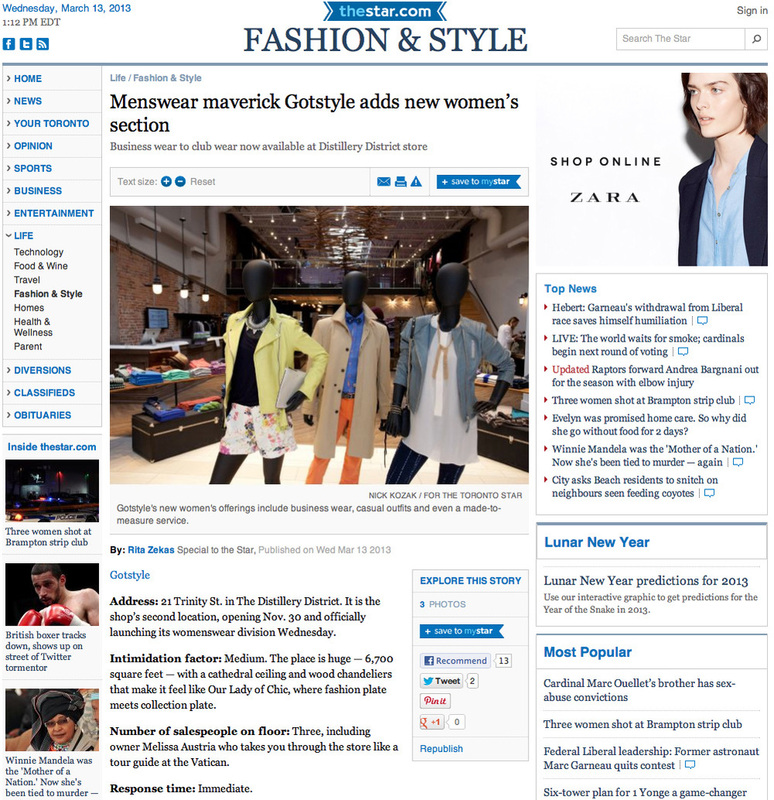 Great news (literally), the Toronto Star covered our foray into womenswear in today's paper. Pick it up or read it online for all the details on our official launch of Gotstyle Woman, which is today! "Downstairs, I gravitate to a pair of flip flops with polka dots and a huge, red beaded lip print by Vivienne Westwood ($125). Next to the shoes, I spy an inventive canteen bag by Canadian designer Jenny Bird in suede and hand-knotted leather for $245. The Cuchara bracelets with beads, spikes and semi-precious stones are a steal at $85. These price points won’t cripple the budget. There are must-have basics like a Tiger of Sweden sleeveless, knit maxi dress with V cut-out at the back, which makes for a great layering piece at $179." Austria goes for the offbeat. Everyone carries cashmere cardies but Gotstyle has an Autumn Cashmere with a navy dip-dye down the front for $310.